Art of Clean uses the most advanced systems on the market today. It is a self-contained rotary washer, driven by water. It pressure-washer the surface and immediately recovers the soil and water at the same time. Once attached to the high-pressure line from a truck-mount and then the vacuum hose, it is ready to clean. 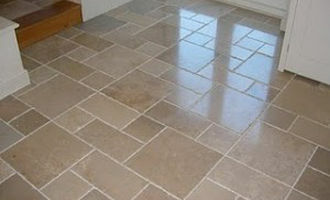 The 8 Step professional process for cleaning and sealing natural stone floors. Step 1: Inspection of the floor: this is to identify any limitations like stain removal, loss of loose grout surrounding surfaces sensitive to cleaning solutions and any other areas that need consideration before the cleaning starts. Step 2: When appropriate we mask the base of units using low tack adhesive tape, to protect from the possibility of overspray on to the units while cleaning at high pressure. Step 3: We vacuum the floor including edges to remove any dry soiling prior to cleaning. Step 4: We apply a specialist pre-spray to the surface of the stone and any grout lines. The specialist spray is allowed to dwell to emulsify the surface soils. They penetrate deep into the stone. Their purpose is to block contaminants from entering the substrate of the stone while at the same time allowing it to expel interior moisture. They are therefore “breathable” or vapour permeable. They can be either strippable or permanent. 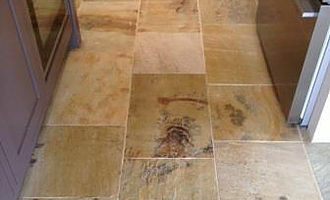 Many are designed for resilient floors but will state that they are suitable for natural stone. Most of these are water based products which are made from polymers so that they can easily be removed with a compatible stripper. Linseed oil and wax. This method needs to be carried out by an experienced technician as it can lead to undesired results if done wrong and it can be hard to correct. Maintenance Plan you wish you had implemented the day of installation! You can invite your floor care consultant to advise you on the plan of attack for restoring your floor. This might include discussing repair work, seal or finish stripping, grout colouring, repairs to etched areas, or treatment to remedy staining. Enquire about what is the best sealing or impregnating product for your particular hard floor. It’s then an easy step to get that initial work and protection carried out. Ask your consultant about the correct maintenance products and how to use them. Vacuum your floors on a regular basis. (the longer between cleans, the more the grit somehow always gets in, will be ground into the floor abrading the protection and the surface). Damp mop only when needed but spot clean with urgency. Schedule a mid year professional clean. Over a 6-month period, your floors are likely to gather build up of dust and other foreign particles that may require a high heat extraction process for removal. Lift the rugs and non-skid underlay, remove all removable furniture; vacuum thoroughly; apply a heavier application of the neutral floor cleaner and damp mop. Schedule an annual maintenance clean. 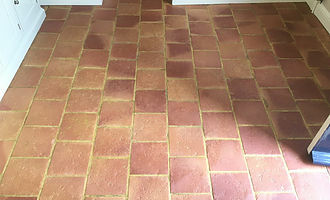 This will include a full hot water clean and as and when appropriate, a re-application of the sealer or impregnator. 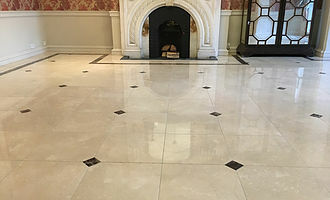 Your floor care professional consultant will carry out a full inspection of wear patterns and recommend any action required should there be any other problems.